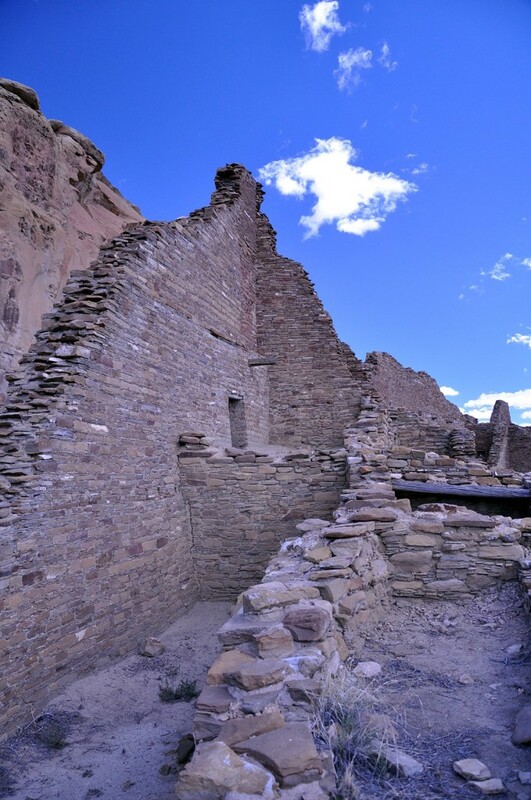 Explore the vast cultural system of Chaco Canyon and the extensive network of outlying communities that developed in northwestern New Mexico and southwestern Colorado from A.D. 800 to 1140. 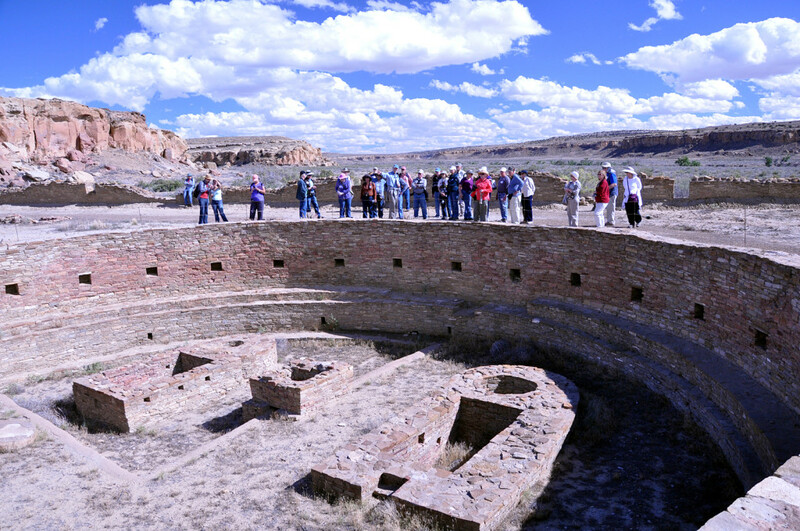 We’ll visit Pueblo Bonito and other spectacular great houses in Chaco Canyon as well as the great kiva at Casa Rinconada. 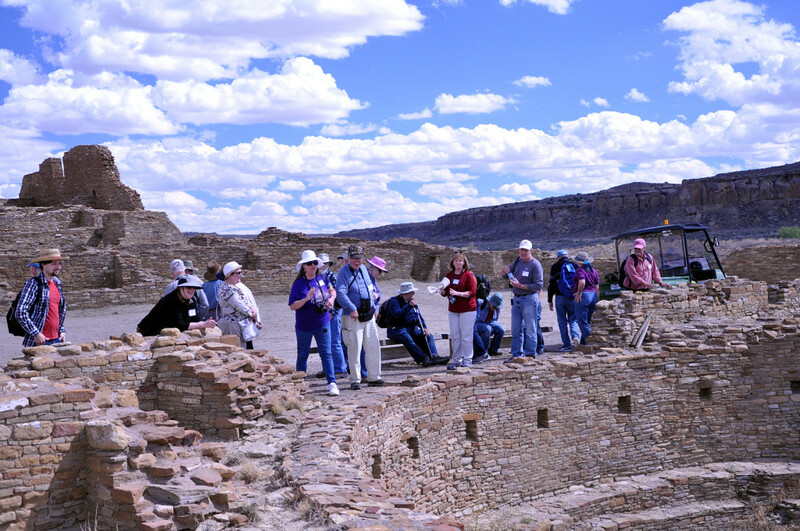 We’ll also have the unique opportunity to visit many of the most important outlying communities that are integral parts of the entire Chacoan complex still being uncovered by researchers. Scholars are still struggling to understand how this vast system developed and operated, and why it suddenly collapsed in about A.D. 1130. To complete the experience, we will tour the modern day Pueblo of Acoma and spend two memorable nights camping in Chaco Canyon. Some of the leading Chaco experts will join us. Join us in Albuquerque for welcome reception and Chaco overview lecture at the Sheraton Airport Hotel. 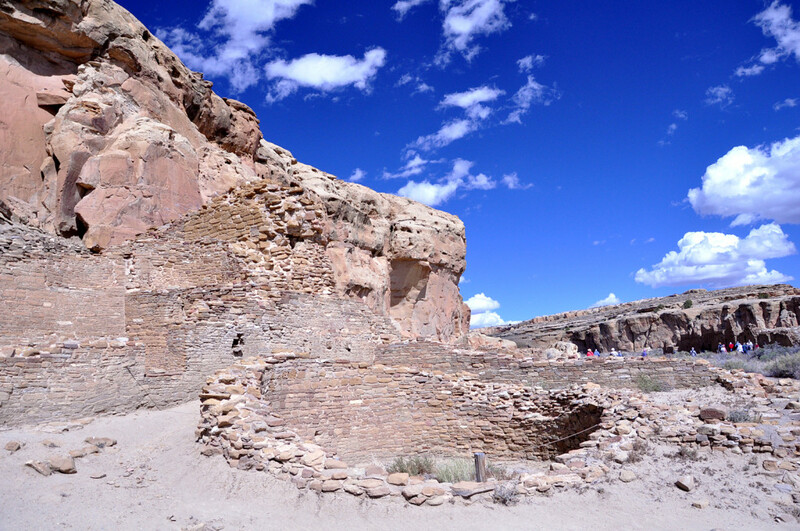 We’ll begin our study of the Chaco culture at the modern pueblo of Acoma, where possible descendants of the Chacoans still live perched on a high mesa. Then we’ll visit Casamero where we will learn about the great houses and Chaco system. We’ll spend the evening in Gallup at the historic El Rancho Hotel. In the morning, we’ll visit Richardson’s Trading Post, one of the largest in Indian Country. 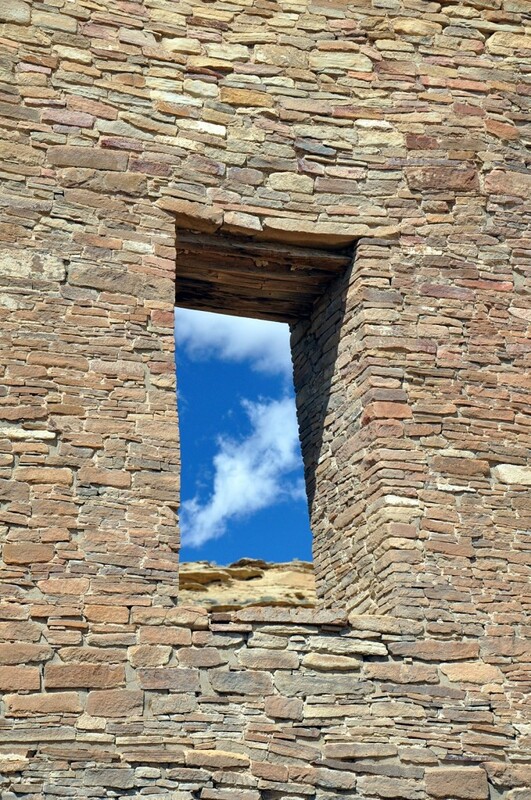 At the Salmon Ruins and Museum on the San Juan River, we’ll see a 300-room Chaco outlier that sits at the end of the Great North Road from Chaco Canyon. We’ll spend the next three evenings at the Farmington. We’ll travel to the northern extreme of the Chaco system in the Montezuma Valley of Colorado and visit Lowry Pueblo with its painted kiva. At the Anasazi Heritage Center, we’ll see two small outliers and an excellent new museum where we’ll study the connection between the Chaco culture and Mesa Verde. Continuing our visit to the outlier communities, we’ll visit Aztec Ruins National Monument where the Chacoans may have tried to move their center. Then we’ll explore Chimney Rock, a spectacular setting for ancient astronomy used by the Chaco people to predict movements of the moon. 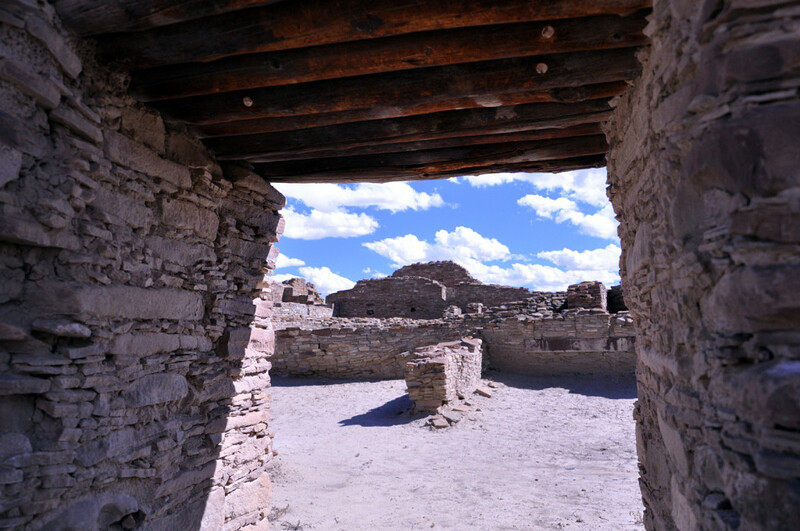 We’ll begin our three-day exploration of Chaco Canyon proper. We’ll visit the great houses at Hungo Pavi, Chetro Ketl, and Pueblo Bonito. We’ll camp the next two evenings in the park under brilliant skies, where our outfitter will provide our meals, tents, and every comfort (except showers). We’ll take a 5-mile roundtrip hike to Pueblo Alto, where an extensive research project took place. After lunch we’ll visit Pueblo del Arroyo, the south canyon sites, and the great kiva at Casa Rinconada. We’ll begin the day with a 3-mile roundtrip hike to Wijiji, a never occupied Chacoan great house. After lunch, we’ll travel to the outlier community of Pueblo Pintado and then return to the Sheraton Airport Hotel in Albuquerque for a soft bed and farewell party. Cost includes first-class hotel accommodations based on double occupancy (single supplement is $240), as well as tents, sleeping bags, and meals while camping for two nights at Chaco Canyon. Cost also includes lunches, happy hours, expert Conservancy and special guides, admittance fees, tips, tours, orientations, background reading, and surface travel via air-conditioned vans. Not included are meals not listed above and travel to and from Albuquerque. NOTE: The tour is at altitudes of 5,000 to 7,000 feet. People with respiratory problems should consult their physician. People unaccustomed to higher altitudes sometimes experience fatigue and dizziness. An extensive amount of walking, some of it on primitive backcountry trails, is required. The longer trail hikes at Chaco Canyon require from 3 to 5 hours to complete.